Hello friends. I am a reuse artist, inspired first during childhood by my ever resourceful parents to live a thrifty lifestyle and “make do” with materials at hand. Today, I am inspired by the wonders of nature where consistent cycles of reuse and renewal sustain the lives of plants, animals and man. 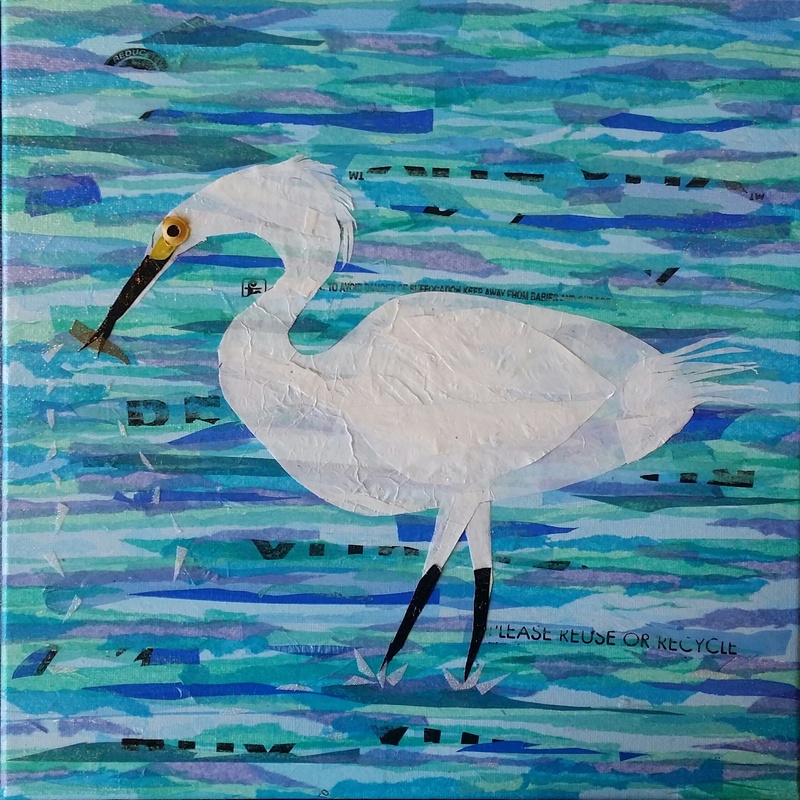 I echo these lessons of reuse and reclamation in my art, creating mixed media pieces inspired by nature using a wide variety of salvaged materials. We live in a throw-away society and waste resources daily that could otherwise serve another purpose. I am alarmed at the waste generated by humans that ends up damaging our environment either by polluting our air and waters, entering our food chains, or causing direct harm to wildlife. And while I am dismayed at the destruction to natural resources caused by over-consumption in today’s society, I am encouraged by the example of life-supporting reuse concepts that nature provides if we would only take notice. Consider the deciduous forest, where trees shed leaves seasonally. These leaves fall to the ground and for a while provide shelter for small living creatures living on the forest bed. Ultimately the leaves decompose, providing rich nutrients to feed new growth and repeat the cycle of life. Imagine a world where humans used existing resources in a manner inspired by nature. What could that world look like? Buttons sorted by color in my studio and stored in used clear containers. My mixed-media work incorporates materials that have been discarded or thrown away. I gather these materials from my own daily discards, from friends and family members, from trash found in my travels, and from thrift stores, reuse centers and other reuse businesses. I collect fabric scraps, used tissue papers, coffee filters, broken jewelry, buttons, eggshells, plastic bags, and more. After gathering materials I spend delightful hours sorting and organizing them either by type, color, subject matter, or any other characteristic that makes sense. I love the sorting process! It’s a chance for me to indulge in handling the materials and thinking about the possibilities they hold in their next role in life. All things are possible at this point in the process!! My materials are carefully sorted by color, which in turn becomes the focal impact of almost every piece I create. I view the world through a kaleidoscope of color. It is the dominant element that I notice in any object I behold; before line, before form, before function or before meaning. Color reigns supreme in my view of the world, and that color lens translates vividly in my art. In addition to color, the materials I choose add a distinct texture to my work, and I often encourage viewers to touch my art to explore the texture! Layered tissue and porous papers build ridges and valleys on the canvas; fabric pieces turn hard and rough when treated with a sealer; old buttons and broken jewelry create tactile images that beg to be examined by hand; delicate broken eggshells provide unexpected strength and a cool feel when glued to a canvas in mosaic style. Recently, I have begun to explore line and movement in my art. As I become more familiar with manipulating a specific material, I work with layering, stacking and juxtaposing hundreds of pieces of the material to create a sense of line and movement across the canvas. Want to know more about my journey as an artist? Check out my Bio page.